This is an easy mountain bike ride through two of Northern Michigan's most scenic river valleys. The route is almost entirely forest roads and old two-tracks and crosses through two distinctly different valleys separated by a low ridge of hills. You begin on the Warner Creek Pathway that sidles a small valley dominated by O'Briens Pond. A short segment of the North Country Trail (NCT) leads south to Jordan River and Pinney Bridge Roads, which winds through the wild and beautiful Jordan River Valley. 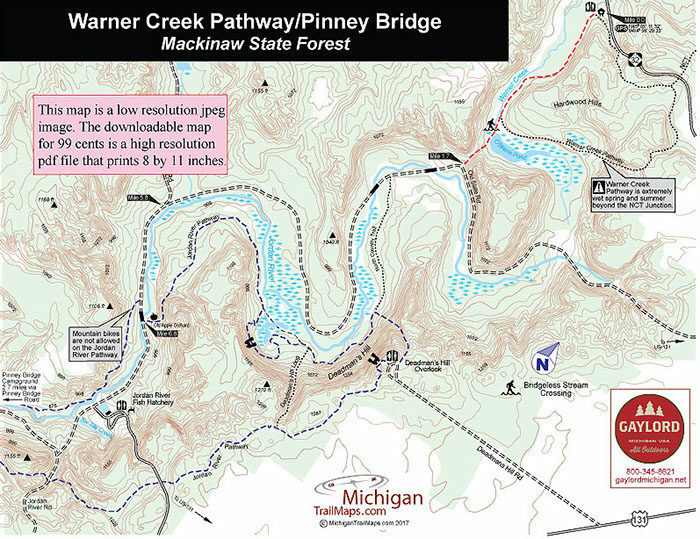 The entire route to the Pinney Bridge State Forest Campground is a 12-mile, point-to-point ride or a 24-mile day if you backtrack to the Warner Creek Pathway Trailhead on M-32. To shorten the outing, merely turn around sooner along Pinney Bridge Road. 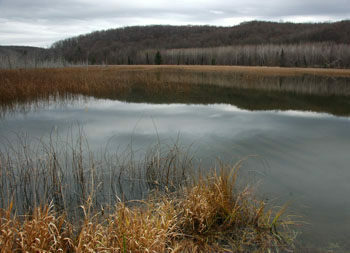 The Jordan River Valley is an 18,000-acre block of the Mackinaw State Forest, protected from future logging or gas development. Most of it is centered around the Jordan River, Michigan's first National Wild and Scenic River and a popular destination for anglers fishing for brook trout. Also winding through the valley is the Jordan River Pathway, an 18.7-mile loop that is not open to mountain biking. According to one legend, the river was named by 19th century settlers who gazed over the forested valley from the edge of Deadman’s Hill and proclaimed that this must be the river to the promised land...the Jordan. The area was heavily logged in the early 1900s with lumberjacks leaving behind their telltale trademark, a sea of stumps. But since then the forest has recovered and now is proposed as an old growth forest area. Deadman's Hill serves as the trailhead for the Jordan River Pathway and Pinney Bridge Campground, a walk-in rustic facility, is the halfway point where backpackers spend the night. Much of the valley floor is quite boggy and wet, the reason mountain bikes are not permitted on the state forest pathway. Beyond the junction with the NCT, Warner Creek Pathway can also be extremely wet in the spring and summer or after recent showers. Most of this route is dry but the beaver dam at O’Brien’s Pond can be a wet and muddy crossing at times. From the parking lot head to the right. The pathway follows an old railroad bed that today appears like an overgrown two-track. The trail quickly swings south and follows the base of Hardwood Hills with Warner Creek just to the west. The creek is usually not visible but the sloping hills all around you make for an interesting start to the ride. Within a half mile the creek and the cedar swamp surrounding it appear and at Mile 1.2 is the well posted junction with the North Country Trail. Head right to follow the NCT. The left fork is Warner Creek Pathway, which should be avoided. The pathway was built as a cross-country ski trail, the reason the next half mile is under water most of the year. 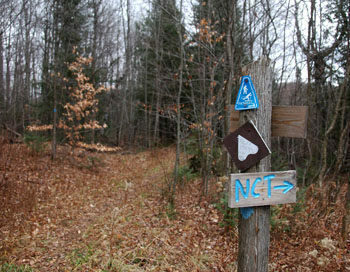 The NCT heads south as the righthand fork and within a hundred yards breaks out at the western edge of O'Briens Pond. More like a small lake, O’Briens Pond is a beautiful spot, the watery center piece of a valley enclosed by forested hills. There may or may not be a wooden plank that crosses Warner Creek where it flows out of the pond. 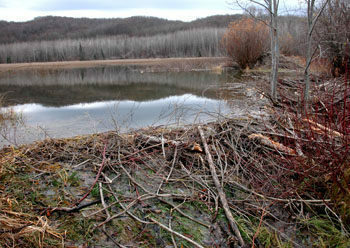 If the planking is no where to be found you’ll need to tip-toe carefully across an extensive beaver dam that controls the pond's water level. Or simply ford the stream. Beyond the pond, the NCT continues south along the former railroad bed as it passes through a gap in the hills for the steepest climb of the ride. At Mile 1.7, the NCT joins Jordan River Road. Head south on the seasonal dirt road and stay on it when the NCT swings away in a short distance to merge with the Jordan River Pathway. The pathway is off-limits to mountain bikes. Within a mile Deadman's Hill Overlook can be seen along the tall ridge line above the valley floor to the left and at Mile 5.8 you pass the junction with Marsh Road. In another mile Jordan River Road uses a vehicle bridge to cross to the east side of the river. The Jordan River Pathway also uses the bridge but keep in mind that mountain bikes are banned from the trail. You pass the Jordan River National Fish Hatchery and ascend to the junction with Pinney Bridge Road reached at Mile 8.2. 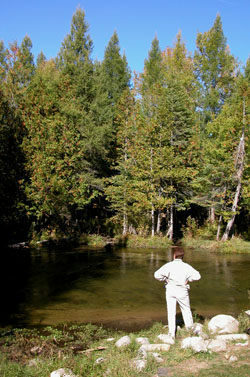 The hatchery can be accessed and makes for an interesting stop to check out the raceways full of trout or salmon fry. Head right to continue on Pinney Bridge Road for one of the most enjoyable segments of the ride. For the remaining 4 miles the dirt road skirts the river all the way to Pinney Bridge with the blue ribbon trout stream in view most of the time. Here the Jordan tumbles along just to the right, cascading through numerous fallen cedars and swirling pass small grassy islands. Forested hills border you on left side of the road. Pinney Bridge is reached at Mile 12. You can park your bike and hike across the bridge to the walk-in campground just a quarter mile to the north. Located in a grassy meadow, the site of a logging camp in 1915, the campground has picnic tables, vault toilets and drinking water. At the Warner Creek Trailhead off of M-32 there is a large parking area and an information sign. At Pinney Bridge, the turn-around spot for this route, the campground is a quarter-mile walk and features, picnic tables, drinking water and a vault toilet. There are no vehicle entry fees at Warner Creek Pathway but there is a donation canister to help with trail maintenance. The trailhead for Warner Creek Pathway posted along M-32, 2 miles west of US-131. Contact the Gaylord office of the Department of Natural Resources (989-732-3541). For travel information contact the Gaylord Area Tourism Bureau (800-345-8621; www.gaylordmichigan.net).